The geometric blocks of 1980s video game Tetris are replaced by Soviet-era apartment buildings in Tower Block Tetris, a mobile game by Lithuanian designer Lukas Valiauga. The objective of Tetris is to align the blocks that fall down the screen, called Tetriminos, into lines of 10 without gaps. In Valiauga's Tower Block Tetris, prefabricated concrete housing blocks are used in place of the of the traditional Tetriminos, in reference to the socialist modernist housing estates built across the Eastern Bloc in the mid-20th century. "The game is a playful tribute to a not so playful reality of monotonous and bleak cityscapes populated by tower blocks from a bygone era," said Pajitnov. "Very specific for Eastern Europe but evident everywhere else too, these relic tower blocks usually mark failed social programmes and neighbourhoods planned as clumsily as some failed building block game," he continued. 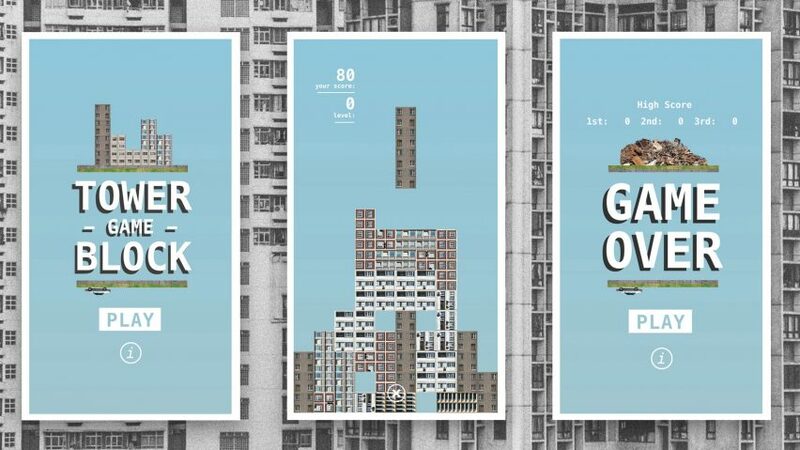 "Playing on a visual metaphor of tower blocks being actual blocks in a Tetris-style game invites the player to take a different and a more playful look into the architectural phenomena that still surrounds us." The popular tile-matching puzzle video game was originally designed and programmed by Russian game designer Alexey Pajitnov in 1984. Valiauga decided to upgrade the game in an attempt to highlight how European cityscapes are changing and to create a more engaging interaction with the topic. He suggests that the game could be developed to incorporate other architectural styles and eras while also commenting on the social problems associated with them. "Some are still around us and some are already demolished and replaced by luxurious new condos," said Valiauga. Tower Block Tetris can be downloaded on Android from the Google Play store. It is by no means the first time the worlds of architecture and video gaming have met. A United Nations initiative has seen the video game Minecraft used to get communities designing their own public spaces. The coordinator of the programme told Dezeen that local authorities were "amazed to see that young women from slums could design as architects or urban planners". Meanwhile, Jose Sanchez, the developer behind another architecture-focused video game, Block'hood, told Dezeen that the medium was becoming an increasingly important tool for designing cities.